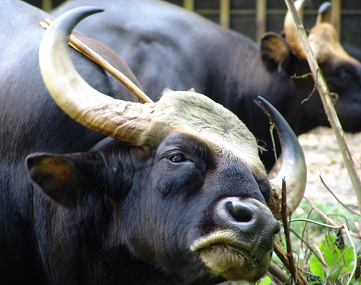 State animal of Nagaland (Gaur) – complete detail – updated. Description of State animal of Nagaland. Name of the State animal of Nagaland is Bos gaurus. Habit and habitat of Gaur. 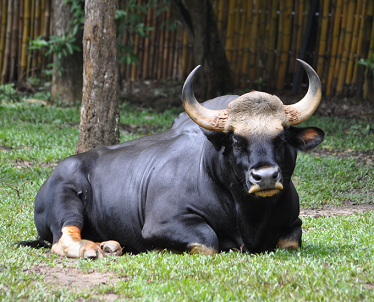 Indian bisons are found on the forested hills and grassy areas. Indian bison is a herbivores animal. They feed on grasses, herbs and shrub, with high preference for leaves. They also it feeds on coarse dry grasses, and bamboo. Gaur have an alarm call which is a high pitched snort followed by a growling “moo”. They typically feed in the early morning and evening………………. They are social animals, and live in small groups. Breeding takes place year-round, but it is mainly between December and June. They reaches sexual maturity between 2 to 3.5 years. Bos gaurus is a Schedule – I animal, according to wildlife (Protection) act, 1972 and classified as Vulnerable (VU) by the IUCN. Weight of adult male is between 600 kg to 1500 kg., and the weight of adult female is between 400 kg to 1000 kg. Size between 240 cm to 340 cm. and the length of tail is between 70 cm to 105 cm. They are about 170 cm to 230 cm high at the shoulder. 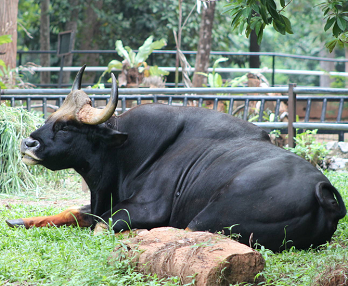 They have huge head, deep massive body, and sturdy limbs, the gaur is the embodiment of vigour and strength. A newly born Gaur is a light golden-yellow, which soon changes to fawn, than to light brown, and so to coffee or reddish brown. The sleek, dark coat is dark brownish black in mature males and dark brown in females. The shank and forehead are creamy white or yellowish in color. The color of the eyes is brown. They have shoulder hump, especially pronounced in adult males. Both sexes have short, fine and glossy hairs, and the hoofs are narrow and pointed. Both sexes carry horns, which grow from the sides of the head. Length of the horns is between 60 to 110 cm. Color of the horns is pale green or yellowish brown throughout the greater part of their length. Males are larger than females. Bos gaurus found in the Western Ghats, in particular Nagarhole, Bandhipur and Mudhumalai complexes. They also found in few Indian national parks (Nagarhole National Park, Bandhipur National Park, and Mudumalai National Park). They prefer evergreen forests and moist deciduous forests, but also occur in dry deciduous forest areas. Mostly they are found in the hilly terrain below an altitude of 1,500 to 1,800 m. They occur from sea level up to at least 2,800 m altitude. In the Himalayas, they are seldom found at 6000 ft. and keep mainly to the foothills. 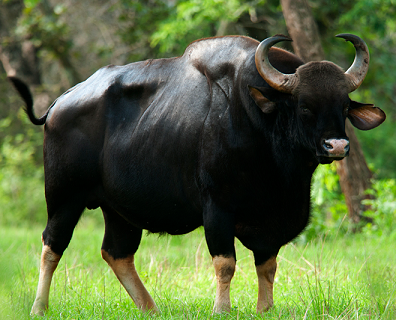 Indian bisons are found on the forested hills and grassy areas. They are largely confined to evergreen forests or semi-evergreen and moist deciduous forests, but also occur in deciduous forest areas at the periphery of their range. 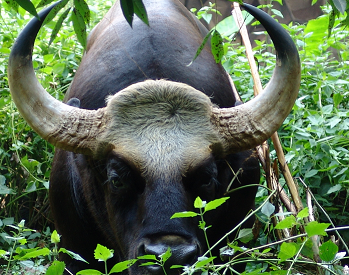 Forests are essential to the existence of Gaur. 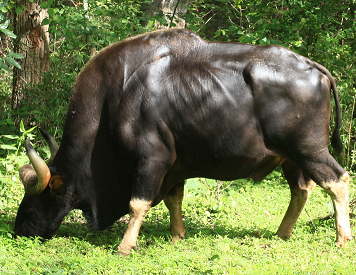 Gaur have the habit of visiting ‘salt-licks’, spots where the ground is impregnated with salts and other minerals. Indian bison is a herbivores animal. They feed on grasses, herbs and shrubs, with high preference for leaves. They also it feeds on coarse dry grasses, and bamboo. Gaur have an alarm call which is a high pitched snort followed by a growling “moo”. They typically feed in the early morning and evening. They are social animals, and live in small groups. Sometime medium size groups of up to 30 to 40 individuals. Breeding takes place year-round, but it is mainly between December and June. They reaches sexual maturity between 2 to 3.5 years. One calf, after a gestation period of about 275 days. Average lifespan of Indian bison is between 25 to 35 years.